While to many this question seems shady, the reality is you live in Flori-da, a state that now legally allows use of medicinal cannabis. If your answer is yes, you may have some questions about how to get it. You are not alone. Since 71 percent of Floridians voted in favor of legalizing medical marijuana in 2016, and Amendment 2 became law, a few things are sure. You can get marijuana legally in numerous locations across the state. In order to get it, you have to go to a doctor to authorize you to use it, one who has been certified by a two-hour course approved by the Department of Health. There are now more than 1,700 physicians in Florida for you to choose from. Via doctor’s orders, patients who suffer from various ailments such as chronic pain, migraines, PTSD, anxiety and life-threatening illnesses are entered into a state registry and apply for a medical marijuana identification card. As of press time, there were close to 130,000 active state ID card holders. Once you have your card, which the state says takes about a week, you can go to a dispensary and purchase marijuana. There are only 14 companies approved by the Department of Health called Medical Marijuana Treatment Centers that operate 55 retail storefront dispensaries throughout Florida. MMTCs are the only businesses allowed to grow, process and sell the product in the state. “So you have to do everything from seed to sale,” said Michael Costa, regional dispensary operations manager for Curaleaf, an MMTC that runs 11 dispensaries in Florida, including in Fort Myers and Lake Worth. Curaleaf’s marijuana plants are grown and processed in Miami-Dade County. The state limited MMTCs to 25 dispensaries each in Florida, so you’ll probably see new ones popping up. Since Florida does not allow smoking marijuana, vaping is the thing closest to it. Curaleaf’s most popular products are vape cartridges that are either filled with oil infused with marijuana compounds or the dried flower or bud itself sealed inside a pod. Notably, cannabis with significant amounts of THC is much more popular than the “low-THC” varieties. In just the week of Sept. 14 to 21, retail stores dispensed 40.1 million milligrams (or 1,446 ounces) of medical cannabis, including 1.9 million milligrams of the low-THC variety, the DOH says. It’s still illegal to own or grow the flower, or roll and smoke a joint, though this state rule is being challenged in court, one of many areas of litigation over Florida’s implementation of Amendment 2. Right now you can pretty much just buy edibles and oils, and you can vape. Depending on your doctor’s recommendation, there are different varieties and strengths. While CBD (cannabidiol) oils provide benefits without getting you high, others with more THC do cause those effects. Usually doctors suggest a combination of the two. Pretty easy, right? So where do you start? What doctor should you see? Are there dispensaries near you? Check our updated cannabis guide and dispensary map on the following pages to get to the bottom of it all. The amount of marijuana consumed in the United States is roughly estimated as a $10 billion to $20 billion business. These numbers are far from perfectly accurate as for the most part, transactions for product are mostly off the books because sales and consumption are still federally prohibited. States such as Colorado, Washington, California, Oregon, Maine, New Hampshire and Alaska, which have legalized recreational use, have seen increases in sales and tax proceeds in addition to population surges and rising median real estate values. In Florida, medical cannabis sales are currently not taxed. In addition to getting the bottom of the basics a consumer may wonder about, there are a few weird questions we had to ask. Can you overdose on marijuana? No. You cannot overdose and die from marijuana. But if you take way too much — which is especially easy to do with tasty edibles like brownies — it’s not uncommon to spend a few very long, unpleasant hours riddled with anxiety. Can you invest in marijuana companies? Yes. 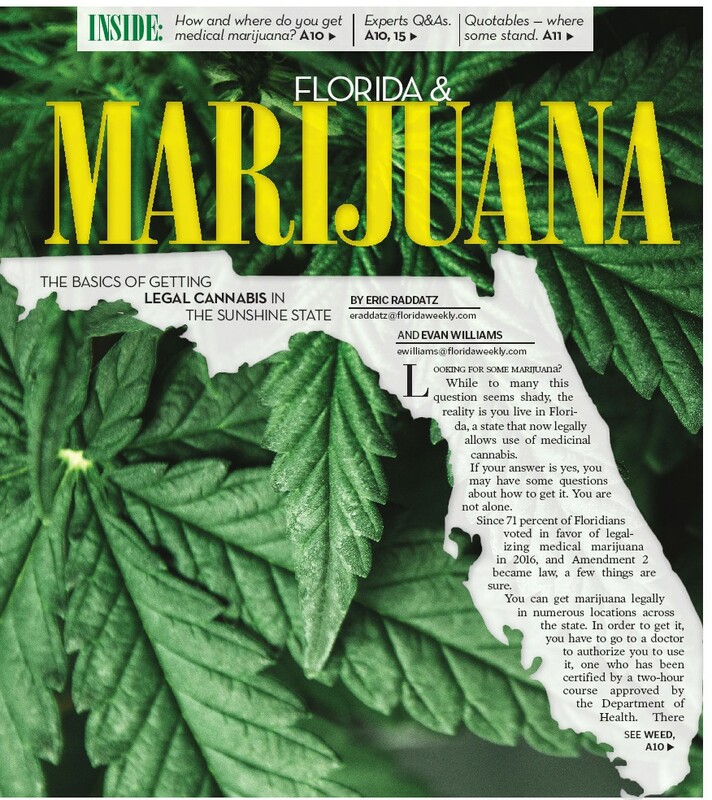 But first read Florida Weekly Money & Investing columnist Eric Bretan on why you should “hold off on buying marijuana stocks” in last week’s edition. How much will this industry be worth by 2020? Florida estimates a $1.6 billion industry by then — not including the possibility that recreational pot will become legal. In this edition you’ll also find answers from medical marijuana experts. 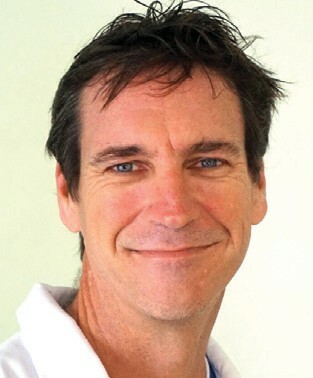 That includes Fort Myers physician Dr. Gregory R. Sonn, who runs Iona Cannabis Clinic. He is one of a growing number of doctors certified to approve patients for an official Florida medical marijuana ID card and order a variety of products for them. 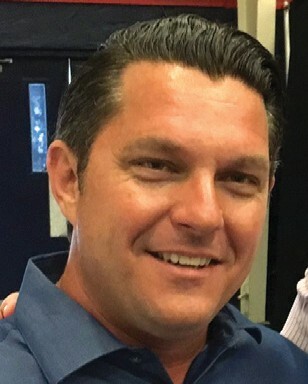 Dr. Sonn’s Iona Cannabis Clinic has opened offices in Key West, Islamorada, and last month in Port Charlotte where Dr. Tucker Greene, who worked in emergency medicine and medical toxicology in Southwest Florida, including for 15 years at Cape Coral Hospital, will preside over exams. “We’re trying to broaden our patient base and provide more service to people in other areas,” said Jodi Hahn, regional manager and executive assistant for Iona Cannabis Clinic. Why shouldn’t you continue to buy illicit weed from your dealer and CBD oil from gas stations? Dr. Sonn in Fort Myers estimates many patients spend $45 to $100 per month on product, though it could cost much more. A marijuana patch can cost $300 per month. And it costs $225 for an initial visit to Dr. Sonn, plus the cost of applying for a Florida ID card and renewing it every seven months. None of that is covered by insurance. So why not go to a dealer — besides the obvious fact that it is illegal (possession of less than 20 grams is a first-degree misdemeanor in Florida)? And there is medical expertise. When it comes to CBD oil, Mr. Costa argues again that the approved medical variety is safer and more reliable in its production and dosing. Interest in medical marijuana has become widespread even among some who have never used it in the past in any form. On Sept. 21, Dr. Sonn and his staff held an after-work Cannabis Culture Fest social seminar at the Broadway Palm Dinner Theatre. A huge marijuana-leaf ice sculpture greeted guests, who ranged in age from their 20s to the 80s. Most appeared to be aging baby boomers. Afterwards about 60 people, nearly half of the 125-person limit on the invitation, signed up for a visit to potentially become a Florida marijuana ID cardholder, said Iona Clinic regional manager Ms. Hahn. People mingled outside the auditorium, where Florida’s Medical Marijuana Treatment Center businesses, which operate dispensaries, including Curaleaf and Trulieve, had displays and answered questions. At another table, Jaime Renee Cruz of Cruz Cannabis Cooking, and associate Ashleigh Rankin, showed attendees how to make marijuana candies. Fort Myers native Stephanie Sumasky, 27, is one of Dr. Sonn’s patients. She vapes (a cartridge filled with marijuana oil is fitted into a vape pen) as well as makes edibles to control pain and anxiety, and as a form of stress relief. The fading, rearranging, but still prevalent stigma of marijuana culture was a theme underlying the event. One 81-year-old Fort Myers man who got a prescription to use CBD infused marijuana oil to control the pain and nausea associated with radiation treatment for prostate cancer declined to give his name. He puts six to 10 drops of CBD oil in his coffee each morning. “I think there still is a stigma,” he said. A Lee County high school teacher, Cape Coral resident Stephanie Peace, 44, said she wants to be honest with her students about marijuana and how it helped her after she was diagnosed with stage 4 lung cancer. But she treads carefully. “In my profession I have to be super careful,” she said. After her cancer diagnosis in 2015, the illness metastasized to other parts of her body. Although she had not previously been a recreational or medicinal user and didn’t especially want the drug in her house, her loved ones had used it with success. In 2016 she started taking marijuana, often by making her own edibles, and adjusting her own dose. The first time she tried it, she simply got high. But she also found it helped her cope with anxiety during a difficult time, boosted her energy level, helped her sleep and eased inflammation from her chemotherapy medication. Thanks to surgery and other treatment, her cancer is now in remission. She also believes marijuana may have increased the effectiveness of her chemotherapy, a claim that can’t be proven for lack of research, though Dr. Sonn suggested in his presentation that cannabis could amplify the effect of other medications. Dr. Sonn made his way around the room before attendees filed into an auditorium and munched on some provided snacks as he lectured and took questions for about 45 minutes. A physician who practiced hospice and palliative medicine for 18 years before starting his own health and wellness practice four years ago, Dr. Sonn has a passion for the potential medicinal effects of cannabis. Most of his patients are age 50 to 80, he said, and suffer from inflammatory conditions such as arthritis, that cannabis can help relieve. One man in the room called out, “A lot of us, I think, are dying to decrease the opioids.” Could marijuana help do that? Dr. Sonn explained that it depends on each individual’s level of commitment and situation but that marijuana can be used to wean patients off opioids. One of Dr. Sonn’s patients, a 49-yearold Cape Coral man named Scott, said marijuana helped him mostly stop taking opioid pain medication. He declined to give his last name because of the still- lingering stigma of impropriety around pot smoking, while almost no one would hide from being an occasional drinker. Around 2013, Scott started buying weed from a dealer and infused it with coconut oil using a countertop Magical Butter herb extractor. At the time he had been on prescribed opioids including Percocet and morphine for more than three years. The marijuana allowed him to wean himself off regular use of those harsher drugs, he claims, and by the time he went to Dr. Sonn in 2017 he was only taking one pill every now and then. The medical marijuana experience has allowed him more variety and control over his use of the drug, and allows him to experiment with new products. Depending on his pain level, he adjusts how much CBD and THC he takes to find a balance that works for him. “The last four days I slowed down on my nighttime THC,” he said. He also has a choice between strains that include more Sativa marijuana, which typically leaves patients more awake, and Indica, which is more likely to cause drowsiness. The marijuana is less powerful than the opioids in its level and immediacy of pain relief, he has found. A survey on cannabis research by the National Academies of Sciences, Engineering, and Medicine found insufficient evidence to either support or refute the success of cannabis users achieving abstinence from other addictive substances. But a more recent study published in the American Journal of Public Health in November 2017 found that the legalization of recreational cannabis resulted in a modest short-term reduction in opioidrelated deaths. Another study published in JAMA in May found that there was a reduction in opioids prescribed in the Medicare Part D population in states with medical marijuana policies. Dr. Gene D. Mahaney, president and medical director of Pain Management Consultants in Fort Myers, is a specialist in anesthesiology, pain management and addiction medicine. Dr. Mahaney is hesitant to write orders for medical marijuana for patients because the drug’s ongoing illegal status at the federal level could put his practice at risk of being prosecuted, even if that’s unlikely. “So it puts us in a bit of a quandary in that patients we think would be appropriate, there is a concern of the DEA coming in and taking away your license for doing that,” he said, noting that that has happened in California and Oregon. The federal Drug Enforcement Administration still classifies marijuana along with heroin and other hard drugs as a schedule I controlled substance with “no currently accepted medical use” — a definition denied by states including Florida, by patients, doctors, and researchers across the world. While there has never been an overdose death attributed to marijuana and many doctors call it safer than alcohol, the DEA lists morphine, oxycodone, and even fentanyl, drugs which continue to cause thousands of overdose deaths each year, as having a lower potential for abuse than cannabis. The Rohrabacher-Farr amendment passed in 2014 prevented the U.S. Department of Justice from using federal funds to “interfere” with states’ medical marijuana laws, according to the National Conference of State Legislatures. “So there is some protection for doctors, patients and providers at the state level,” Mr. Costa of Curaleaf said. But early this year, Attorney General Jeff Sessions appeared to reverse or weaken that rule in a memo giving U.S. Attorneys permission to once again prosecute in any state based on the old Controlled Substances Act of 1970, which prohibits cultivation, distribution, and possession of pot. 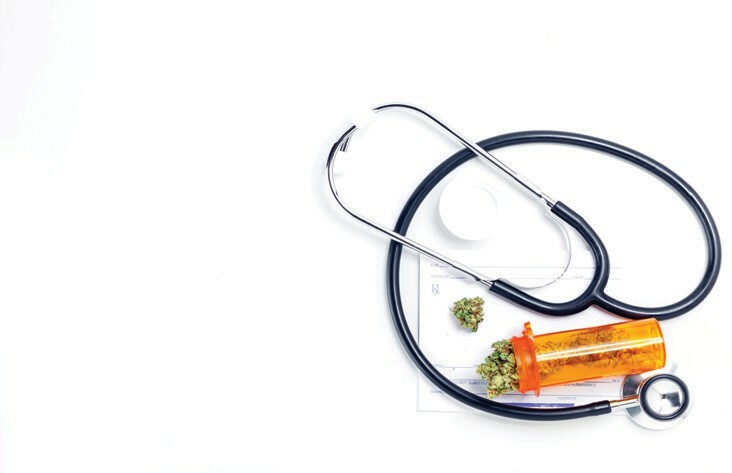 Dr. Mahaney and other physicians are against the federal ban because it has effectively made impossible — at least in the United States — the gold standard, randomized controlled studies that could potentially provide definitive evidence of some of the claims patients have made about marijuana’s effectiveness and vastly expand its use and effectiveness as medicine. The lack of research and the federal ban has also led to a medical marijuana market where mainstream providers may be left out of the loop and patients often don’t get accurate information, Dr. Mahaney said. They may get directions for use from a clerk at a dispensary rather than a highly trained pharmacist, for instance. That’s not to say there hasn’t been substantive research. Dr. Mahaney points out robust studies in Israel and the Netherlands, and is convinced of marijuana’s effectiveness in treating some ailments: nausea (related to chemotherapy), seizures, as a sedative, and for mild pain relief. He believes marijuana could help patients reduce though not replace opioids and other prescription drugs. “As a pure analgesic, it’s not much stronger than Tylenol No. 3,” he said, a pain reliever that includes acetaminophen and codeine. The report details about 100 reports on cannabis since 1999 and concludes based on the quality of the research how conclusive the results are. For instance, it found “conclusive or substantial evidence” that cannabis or cannabinoids are effective in treating chronic pain in adults, chemotherapy induced nausea and vomiting, and improving patient-reported symptoms of multiple sclerosis. Maybe the most conclusive research of all is that more research is needed. The list of conditions for which there is limited or insufficient evidence to support claims associated with marijuana, include, to name just a few: as a treatment for cancers, epilepsy, the symptoms of irritable bowel syndrome, curing addictions, improving symptoms of dementia, of post-traumatic stress syndrome, and better outcomes after a traumatic brain injury. There is also substantial evidence of cannabis use and increased risk of car crashes, as well as the development of schizophrenia and other psychoses, especially among frequent users. Dr. Mahaney sees the federal government backing off approach eventually, if and when more states legalize the drug. In spite of federal rules, that’s clearly not stopping the medical marijuana industry from rolling ahead in Florida, at least as far as possible within the state’s own limits. Michigan-based Liberate Physician Centers employs doctors and staff at clinics there and in Illinois, Colorado and Florida. After officially opening its first Sunshine State office in West Palm Beach in 2015 — in anticipation of the 2016 vote — Liberate has opened clinics both by corporate expansion and franchising in Jacksonville, Port Charlotte, Fort Myers and Naples. “We’re working on rolling out 10 new offices across the state,” said the company’s chief operating officer, Mark Turgeon, who oversees the Palm Beach office. Potential areas of expansion include all sides of Florida. Mr. Turgeon mentioned Boca Raton, Fort Lauderdale, Miami, Tampa, Lakeland, Jacksonville and Orlando as possible locations. Sensitive to the perception of the medical side of business catering to recreational users, he pointed out, “this is not about pot heads and kids getting stoned or anything like that.” Liberate patients’ average age in Florida is mid-50s. But he also suggests that there is a significant amount of crossover between medical and recreational use. When Florida legalizes recreational marijuana, which some predict will happen in perhaps five to 10 years, that could change the market, he said. Mr. Peacock is a consultant for Apothecary Services, which advises those interested in beginning a medical marijuana business . >> How big do you see this getting in Florida? 1. Go to a doctor qualified to prescribe medicinal marijuana. The doctor will be on the medical marijuana use registry. You must have a state ID card. When approved he will give you a prescription that you can bring to a medical marijuana dispensery. 2. Register with the state to get your medical marijuana identification card. You can do this on your own or your doctor can help you with this. There is a $75 registration fee. 3. Go to a dispensary called a medical marijuana treatment center. Show your medical marijuana identification card. You can then purchase a variety of cannabis products. most? You cannot be impaired. And pregnancy information, which is mandatory by state regulations. would hurt marijuana as medicine because it would allow the casual user any product, which means the idea and prescription would be minimalized. Plus, my elderly or marijuana naive patient, which is 60 percent of my patients, would be reliant on a bud tender. (Same goes for flower.) Which if you were any other doctor in the area, would be a good thing. Most have minimum knowledge, but I know the medical and I teach and educate. Florida? The other big companies in Florida were non-physicians. They came in to Florida from Nevada, Colorado and Arizona, advertised for a doctor and got started. I know; they hit me up early in the process. the federal level. Too much money to lose. Insurance companies, VA drug plans, Medicare Part D, the list goes on. Plus I don’t think the government really wants the population as a whole to be healthy. wanted outcomes. “The entourage effect” and “micro dosing” are … (important considerations for me and my patients).